If you’re planning a beach-themed wedding or reception – or even just a destination wedding in a tropical setting – today’s featured wedding favor is the perfect parting gift for your guests! 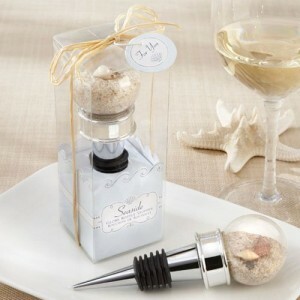 These bottle stoppers feature a chrome and rubber gasket stopper topped with a glass globe filled with sand and shells. The stoppers would be a great table decoration – for guests to take home, of course – but they also come pre-packaged in a box so you can give them as gifts to your guests. You’ll find these stoppers here.